Thanksgiving brings its usual full slate of films to bear, with five new wide releases in all. While this weekend is traditionally friendly to many movies, history tells us that realistically, only two out of the five new films can be successful (three if you stretch the definition). Additionally, as in the previous two years, incoming films must deal with movies bigger than themselves that are already established in the marketplace. This won't be as much of a problem for the pedigreed films that debut over the long holiday weekend, but the smaller ones may be DOA. As the latest project from hyper-prolific director Steven Soderbergh, Solaris comes in with the highest profile. It receives an additional boost thanks to the onscreen presence of George Clooney, who is one of the surest box office bets in recent years. That's not even including mention of producer James Cameron and the fact that Solaris is based on a classic Russian film of the same name. As regards the film itself, though, it looks as if everyone involved in this project has decided to systematically alienate its entire potential audience. For instance, let's look at the concept: a space station in orbit around a swirling ocean planet that can meld with our minds. That's pure sci-fi, right? You sure wouldn't know by the TV commercials, which hide the space aspect like a family secret. Instead, they're trying to sell it like a romance, but as romances go, it's fairly unimpressive looking. I don't think there's any real mystery as to why they took this route; they've made themselves a non-commercial movie with big stars and they're not confident as to who it will attract. Solaris is going to be as pure a test of star power as we've seen since, to pick a not so random example, last year's Vanilla Sky. Like the Tom Cruise film, Solaris is a remake of an unconventional foreign sci-fi feature with romantic elements and a big Hollywood star placed in the lead. Without straying too far into cynicism, audiences today don't like to be challenged that often. Whether Solaris represents a challenge or not is yet to be seen (though it seems likely), but the response Vanilla Sky received last year shows that this kind of film will get a rough ride. Starting off with a modest $25 million, Vanilla Sky broke $100 million in total box office only due to its proximity to the Christmas season. However, that initial $25 million was all Cruise, and Clooney will need to perform a similar feat to get it to that kind of total figure. Evidence for Clooney's box office muscle remains at a fairly small sample size for now; giving him little credit or blame for Batman & Robin (curse you, Schumacher! ), we're left with the slow build in his films from The Peacemaker through Three Kings, the FX driven Perfect Storm, the unconventional success of O Brother, Where Art Thou? and the ensemble of Ocean's 11. Though he was asked to carry few of those films alone, he's been the most impressive element in almost all of them and has made himself a real movie star in circumstances where some would have panicked and ruined their careers. To this end, he really is on the same level as a Tom Cruise, and I think he can carry Solaris to about a $24 million total over the Friday to Sunday three-day period, and $31 million over five days. Solaris shouldn't be a huge earner overall, but it's relatively cheap at under $50 million and should stay profitable. What would Thanksgiving be like without a Disney film? They're not about to let us find out, so we have Treasure Planet as the latest "Mouse House Presents an Animated Tales from the Public Domain" film. Taking the Robert Louis Stevenson classic and turning into a space opera isn't that bad of an idea really, at least from an artistic standpoint. From a business standpoint, it's a bit less of a good idea. With animation, comedy still works, especially of the computer animation variety. Science fiction, not so much. Titan A.E. was a spectacular flop for Fox in 2000 and Final Fantasy closed a studio last year. Part of this failure is due to the difficulty in breaking into the animation business, but DreamWorks's recent success belies that to a certain degree. Disney also had their own action-adventure entry last summer, with Atlantis: The Lost Empire. With a $20 million opening and $84 million total, the movie is one of their lowest grossing animated films in the last decade. The problem when it comes to these films is not just that the potential audience is caught in the animation-isn't-cool trap but that the much younger kids on whom Disney relies simply aren't old enough to care about science fiction and pester their parents into taking them. The animation for the film does look fantastic, though, with a wonderful mesh of the nautical stylings associated with the book and the futuristic designs used to establish the setting of the movie. The voice cast has gone the route of "colorful character actors" as opposed to having a star in a lead role, which means that instead of a wisecracking Eddie Murphy, we get the wisecracking Martin Short, David Hyde Pierce and Joseph Gordon-Levitt (along with the non-wisecracking Emma Thompson). 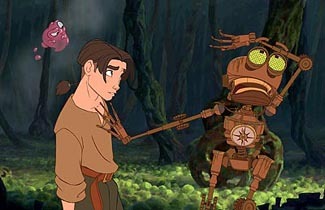 The Disney name still means a lot in the sense of promotion, so Treasure Planet should still do a very healthy business across this holiday weekend. Since it should be able to last through Christmas, a $22 million three-day period ($31 million for five days) should allow it to remain quite the success for Disney. Speaking of unusual choices for animation, Adam Sandler's back with 8 Crazy Nights, the lone holiday-themed film of the openers. A fairly shallow attempt to capitalize on Sandler's supposed "bad boy of comedy" image, the whole thing feels like a miscalculation to me. Only a certain number of Sandler's fans go for his crazy voices shtick and even they'll have trouble with 90 straight minutes of it. Worst of all, it just doesn't look funny. It's almost like an animated Ace Ventura movie without the charm. While it's not about to start out like some of his other films (for example, the recent Mr. Deeds), Sandler does have enough of a following that 8 Crazy Nights should be able to get off to a fair start simply for its novelty value. Don't expect much after this weekend, though. A $13/17 million three/five day split may lead to less than a $40 million total. Two completely disposable looking genre films round out the new wide released films; Extreme Ops and Wes Craven Presents They have Thanksgiving turkey written all over them. Ops is a sad looking film that resembles nothing so much as Vertical Limit (hey, rip off good films, not ones that bombed) with a bit of Cliffhanger thrown in; too bad Christian Duguay isn't half the director that either Martin Campbell or Renny Harlin are. It's like they took a Warren Miller movie and added some terrorists in for no reason. As for They, to paraphrase Kevin Smith, "Stephen King gon' sue somebody". Let's see, a group of kids who faced evil as youngsters only to find that it terrorizes them when they grow up and it's referred to only by an indefinite pronoun? Nope, this is nothing at all like "It". Sadly, sticking "Wes Craven Presents" in front of a title is getting to be almost as bad a curse as "John Carpenter Presents". Remember Wishmaster? No, of course you don't. Both of these films should start near the lower rungs of the top ten, earning between $5 and $7 million each for the five-day period. First place will again be a battle between Mr. Potter and Mr. Bond. Bond has the advantage out of the gate with a $5 million head start. Potter's more than 50% drop from week one to week two would seem to mark it as a quick loser in this battle; however, there are a few mitigating factors in play. Huge initial falls from massive weekends such as Chamber of Secrets' debut frame are basically par for the course. This same drop-off doesn't always follow for further weekends since the initial effect comes from a fallout from the initial weekend's heightened anticipation. Additionally, Thanksgiving is more than friendly to family films, since kids have the additional days off from school and families will make the trip to theaters if they haven't overdosed on tryptophan. The advantage of the holiday should give Potter and company an excellent third weekend of around $34 million for three days, and $44 million for five. This amount will be enough to reclaim first place from Bond, which should match the performance of The World Is Not Enough. That film fell about 35% across Thanksgiving weekend in its second weekend, which would place Die Another Day at about $31 million for three days and $40 million for five days. Both Potter and Bond still have decent chances of passing their predecessors in their respective series. A whole host of returning films round out this crowded slate, though with the long holiday period, there should be room for all of them to play out naturally. The Santa Clause 2 will definitely benefit, as audiences have the chance to see both this film and the Potter sequel from Wednesday to Sunday. $11 million through the end of the holiday will put The Santa Clause 2 well over the $100 million mark as it aims for the $140 million total of the original. Expect a steep drop for Friday After Next, which will lose out slightly under the "sequel no one really requested" category. It should be able to manage about $10 million across the holiday period, though. The Ring, The Emperor's Club, 8 Mile and My Big Fat Greek Wedding all remain films that will challenge for spots in the top ten, with close to $5 million needed to break that slate this weekend.